In 2018, Halloween haunted houses in Arkansas are very scary entertainment. Haunted attractions have lots of zombies, demons, chainsaw murders, and aliens come out around Halloween. Most haunts have animatronics, quality Hollywood type sets, air blasters, costumed actors, and professional makeup. Just visit one of the many haunted attractions around Little Rock, Hot Springs, Fayetteville or Jonesboro to know that. They’ve exported one of the scariest business known to humankind to the rest of the world: Walmart. So in October avoid the Arkansas haunted houses at all costs. Unless you are up for a good scare at Halloween! Do you run a haunted house in the United States? 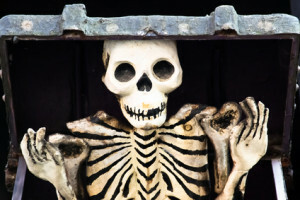 More than 150,000 people came to Funtober last year looking for a haunted attraction. Please see our advertising page or contact us for more information. Funtober on separate pages also has information on pumpkin patches, corn mazes, ghost tours, home haunts and Halloween fun. We have separate attraction links and listings for haunted houses USA, haunted corn mazes, haunted trails, haunted zombie paintball, haunted forests, haunted hayrides, and ghost tours. Asylum is an annual haunted house in Cave Springs, Arkansas. Tickets are low priced entertainment with basic ticket at $15. The Asylum runs from 7 pm to midnight. It is open every Friday and Saturday starting October 6th plus added dates Halloween week. An annual attraction located inside the Lokomotion Family Fun Center in October. Features include a Haunted House and Haunted Laser Tag fun. Open every Friday, Saturday, and Sunday beginning October 12th plus Halloween night. They have feature a party Halloween Bash on October 19th. Creepy Works is a family oriented 3D haunt for all ages. Seasoned staff provide realistic terror. You will be drawn into the depths and lose control of rational thoughts. Open Friday and Saturday nights beginning September 29th. Adult tickets are $12. Creepy Works strives to provide realism to draw in and distort a persons psyche. You will be looking to leave just as quickly as you enter. Creepy Works is staffed by seasoned haunt enthusiasts who’s only desire is for you to have a frightning experience. We have gone to great lengths to provide detailed sets and settings which can be far and few in between. One of the most common questions we receive is “How long does it last?” I can tell you that the effects are residual and will gradually wear off, but you will remember for a lifetime. You will not forget. The Haunted Barn opens October 5th. This is an annual charity haunted house for the benefit of children and adults born with certain diseases. It is open every Friday and Saturday nights in October. Tickets are $10. Attraction is open on Friday and Saturday nights beginning October 5th. Then beginning October 23rd it is open every night through November 3rd. Doors open at 7 pm until 10 pm weeknights or later on Friday and Saturday. Tickets are just $15. Sorry folks this popular Jaycees haunt for over 20 years has now closed. Magic Screams opens October 6th, 2018. Things kick off with a shadow cast showing of the Rocky Horror Pircture Show and more throughout October! Don’t miss this haunted theme park, with attractions for kids and adults like a haunted house, haunted trails, and a spooky hayride, plus a family movie series, live entertainment, and more. They run from 4 pm and close at 11 pm on Saturday and 9 pm on Sunday nights. The theme this year is “Wasteland”. Horrific and gory this is one scary haunt. Prepare yourself or you will be begging to be let out. It features live special effects, computer animation, and over 18,000 square feet of terror in their new location behind Colonial Wine & Spirits. Experience the Abandoned Abyss complete with Hollywood quality costumes and special effects. So scream all you want because no one will hear you. Call 501-398-FEAR for more information. Open Friday, Saturday, and Sunday beginning October 5th. Attraction proceeds support the Bentonville Breakfast Lions Club charities. Nightmares Haunted House has operated for 28 years. Attraction is operated by the local Lions Club. The feature is the Phantom 13 bus ride with a second attraction the Maximum Terror Drive. The ticket booth is open from Sunset until 11 pm. Open Friday and Saturday nights starting September 28th. Tickets are $20. The scary fun starts this year on October 5th. Scared City operates 4 haunted attractions. Haunted Farmhouse, Slaughtershed, Neon Demon, and 3D Funhouse. The Last Ride is $5. A combo ticket for all four attractions is available. Doors are open weeknights until 10:30 pm or on weekends until between 11-12 pm. Call 870-219-0810 for more information. Open every Friday and Saturday nights in October plus every night the week of Halloween. Opens starting October 5th. They want you trembling with fear as you navigate through their 6000 square foot attraction located in an Abandoned Slaughter House. This is a charity haunt. They operate every Friday and Saturday night in October plus Halloween and possibly some added dates. Tickets are $15. The Torture Chamber located at The Warehouse off Edison has operated for 13 years. They are in the scream business. At Torture Chamber you will need to be able to crouch, crawl, and beg for your life. Doors open at 7 pm and close at 12 am on Friday and Saturday or 10 pm on other nights. 2018 will be the 13th year as The Torture Chamber and now Twisted Intent grow deeper and deeper into your greatest fears. Sometimes the best haunted house for you is across state lines. If you find yourself close to the boundary of Arkansas, or that is where the nearest metropolitan area is, there probably is a haunted house that is worth visiting there. I’ve identified these border states with haunted houses for you to checkout in addition to the Arkansas haunted houses. Have you experienced one of these haunted houses? Future readers would be interested in hearing what you thought. Did you have a great experience? Was it worth the price? Would you recommend it to visitors here? Any tips to maximize the experience? I’ll gladly publish what you send me and give you an over the internet hug.